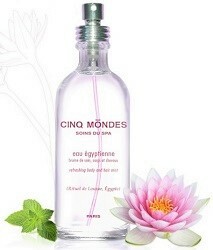 Now Smell This folks, meet Sekhmet; my favorite goddess and today's cover girl for Cinq Mondes Eau Egyptienne. If I could find an un-copyrighted image, I'd include another 'goddess,' too: Olivia Giacobetti, Eau Egyptienne's creator, and one of my favorite perfumers. Cinq Mondes describes Eau Egyptienne (inspired by ancient kyphi recipes) as an "aromatic ritual for body, hair and pillow," a therapeutic mist to calm the mind and moisturize the body. It contains (according to the 'legal' ingredients listed on the packaging) real Nelumbo nucifera (sacred lotus) extract (I'm not sure if this is scented, curative — or both); there's also rose, cumin, mint, frankincense, myrrh, mastic and jasmine on the list of fragrance notes. I'll shamelessly boast that, perhaps like pharaohs and Cleopatra before me, I had a lotus grow, bloom and scent my bedchamber one year — thanks to my husband's green thumbs. I know the blue Egyptian lotus, Nymphaea caerulea, is what we see most in ancient Egyptian art and design, and I'm unsure if sacred lotus was grown in Egypt, too. Eau Egyptienne is a cologne-like, evanescent fragrance: a spicy floral element opens the perfume, a mix of cumin, mint, mastic and rose. The airiness of the flower note in mid-development does remind me of the scent of some water lilies and lotus. Frankincense (with a tinge of cinnamon-clove-carnation) rounds out the fragrance. Eau Egyptienne's extreme dry down possesses a mild muskiness and a hint of myrrh. Though this perfume is light, it has presence while it lingers. When power-sprayed on my skin, it lasts well over an hour; I make sure to get some scent on my shirt to extend the pleasant aromas (perfect for summer and the hottest days). Since Eau Egyptienne is a treatment fragrance, I didn't expect a long-lasting scent experience. I enjoy others in the series, too: Eau de Bangalore, Jardins de Carthage, Eau du Brésil and Eau du Siam (in 100 ml for $61 each); Eau Egyptienne also comes in a 25 ml travel spray ($18). You can experience all four Eaux (sorry, not Jardins de Carthage) in the sample collection: each scent in 25 ml for $49.50. For buying information, see the listing for Cinq Mondes under Perfume Houses. 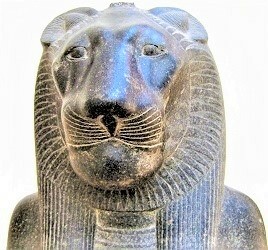 Note: top image of Sekhmet [cropped] via Wikimedia Commons. I love Eau Egyptienne! It’s my spray-it-everywhere-because-I-didn’t-get-a-shower scent and, while it is light, it lasts a good 2-3 hours. I got a 150ml bottle a couple of years ago, which is officially the most ml I’ve ever bought of anything. nicolasix: that is a huge bottle! But I bet it goes fast…. Thanks for the review…this sounds right up my alley! lovestosmellgood: there are SO many great books out there on ancient Egyptian rituals, most involving scent…you should be able to find several titles to explore. LTSG: If you’ve never perused this (https://amzn.to/2rgH1G5) it’s a good place to start and it will lead you to other books. On my list! Thanks Kevin! LTSG: Since my last response, I’ve found these two books that I MUST read: Sacred Luxuries: Fragrance, Aromatherapy and Cosmetics in Ancient Egypt by Lise Manniche and Kyphi: The Sacred Scent by Karl Vermillion. Murals from ancient Rome show Nelumbo nucifera in Egyptian settings, it is believed that it was lost to the west after the classical era. Ah, the blood thirsty Sekhmet! I’m more of a Thoth guy myself. Nelumbo Nucifera exists as an essential oil, but I doubt the ancient Egyptians were knowledgeable enough to extract the scent. It wasn’t an ingredient in Kyphi either. des esseintes: Ah, I like Thoth, too…esp. the associations with writing and learning.